Why do leaves turn shades of yellow, orange and red in Autumn? Chlorophyll is the substance present in leaves which gives them their intense green colour in summer. Chlorophyll is vital in the process of photosynthesis, the means by which plants convert light energy into chemical energy. Sunlight is absorbed into the leaf by chlorophyll. However chlorophyll is not a very stable compound and bright sunlight causes it to break down. To maintain the amount of chlorophyll in their leaves, plants continually have to make it. During the spring and summer chlorophyll is continually broken down and re-made in the leaves of plants and trees in the strong sunlight and warm temperatures which generally accompany these months. The intense green colour of the chlorophyll masks the other plant pigments which are present in the leaves – the red, blue and purple anthocyanins, and the yellow and orange carotenoids. Cranberries, red apples, cherries, strawberries are some of the plants given their red colour by anthocyanins. Sweetcorn, carrots, and bananas are a few of the plants coloured by carotenoids. As the temperature, light levels and daylight hours decrease in autumn the rate of chlorophyll production begins to slow and the amount of chlorophyll in the leaves drops. The red, purple and yellow pigments present in the leaves therefore gradually become more visible. Carotene is more stable than chlorophyll and remains in the leaves after all the chlorophyll has disappeared, giving the leaf a yellow orange hue. The leaves contain higher concentrations of sugar (the glucose produced by photosynthesis) in autumn, because the lower temperatures slow its movement around the plant. The excess sugar in the leaves converts to anthocyanins, which cause the yellowing leaves to turn red. The range and intensity of autumn colours is greatly influenced by the weather. · Low temperatures destroy chlorophyll, but if temperatures stay above freezing, the formation of anthocyanins is encouraged. · Bright sunshine destroys chlorophyll and enhances anthocyanin production. · Dry weather, by increasing sugar concentration in sap, also increases the amount of anthocyanin. 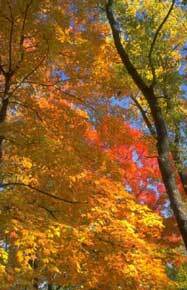 So the brightest autumn colours are produced when dry, sunny days are followed by cool, dry nights.